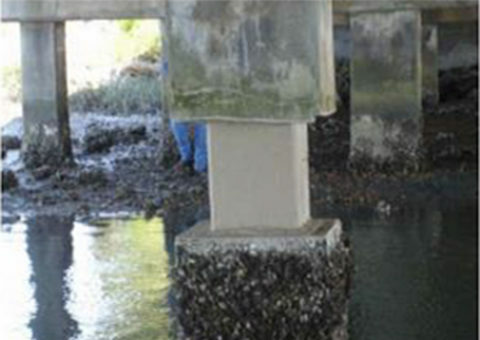 Kelso Coatings was contacted to conduct a test project in the southern United States to prove the capabilities of the CN2000® series of waterproof materials on Bridge Piles exposed to the tidal effects of sea-water. 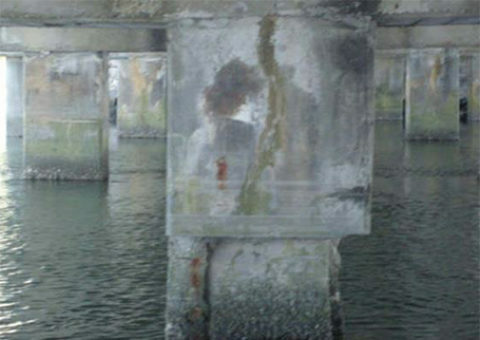 Chlorides are the “crime culprit” that causes corrosion damage to millions of bridges around the world, and cause major economic losses in all countries worldwide. 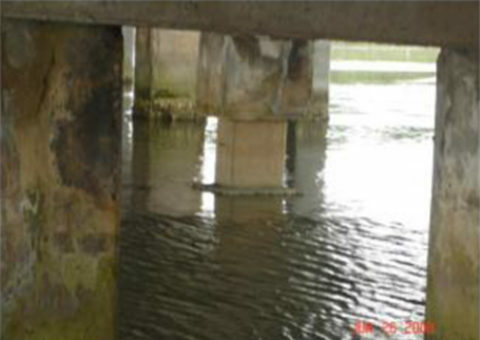 While chloride corrosion to the steel rebar is the main form of concrete structural damage, studying the mechanism of deterioration shows that waterproofing and anticorrosive treatments must be carried out on bridge structures to extend their service life. 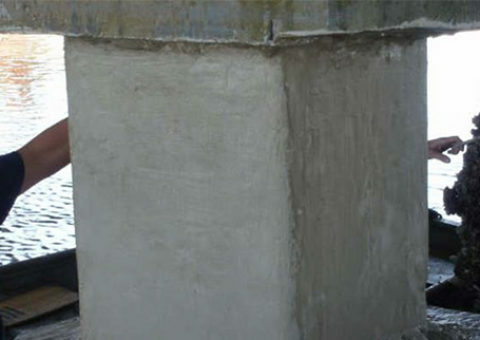 For this, the CN2000® series of waterproof materials have excellent waterproof and anti-corrosion properties and play an important role in the rejuvenation and protection of these structures. 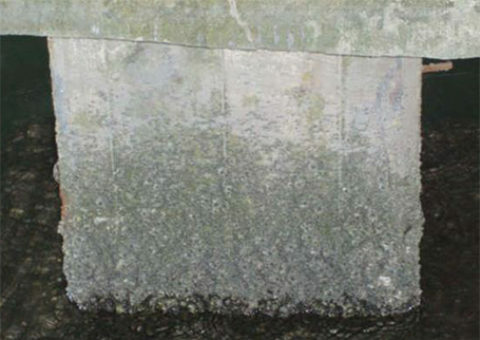 We need to point out specifically, that the pile position in the interface of water and air, the “water level changing area” or “waves splashing zone”, suffers the erosion damage of above ground (atmosphere) and underwater (complete soaking area) environment concurrently and makes this portion of the pile, an area that suffers the most serious corrosion damage. 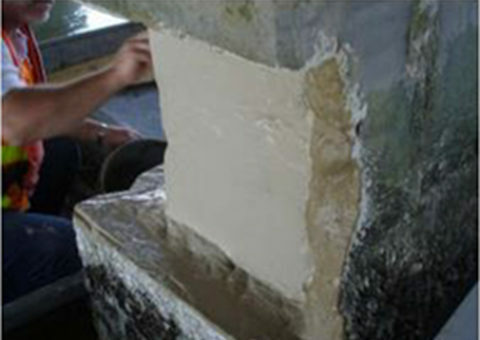 The wet and dry cycle and freeze-thaw cycle of physical damages are particularly notable in this position. 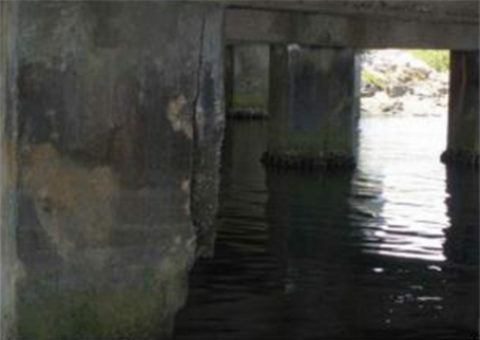 Due to the concrete in this position being in a relatively oxygen-rich environment, it promotes the rapid corrosion of the steel reinforcing bars. 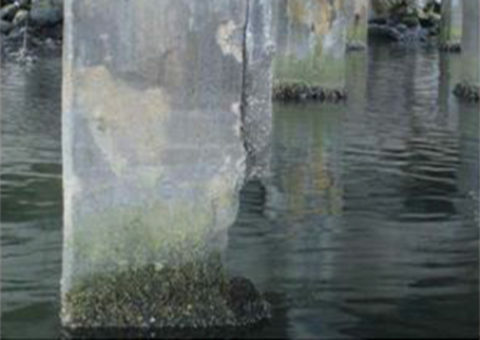 Actions of sea life and microbial biochemical reactions in this oxygen-rich environment will also have their negative effects on the pile as well. 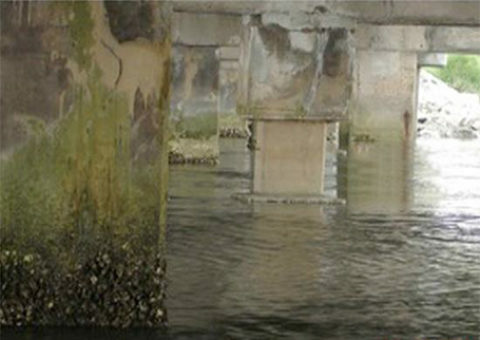 The application of CN2000® Series of Waterproof Materials resulted in a permanent waterproof membrane to the test pile, replacing a vast quantity of concrete that previously, had to be intermittently removed and replaced and never provided a waterproof membrane, but only a thick, porous physical barrier between the corrosive environment and the steel structure within the concrete of the pile. 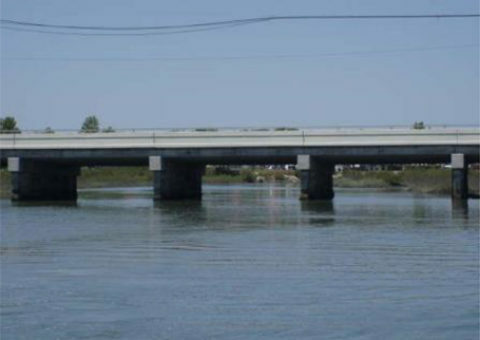 The test project will be analyzed by the Ministry of Transportation technical personnel over the next few months along with the technical data and sample products that were supplied to Department by Kelso Coatings. 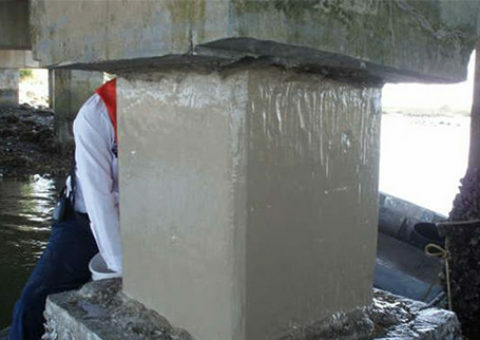 Kelso Coatings is confident that all expectations of the CN2000® (CCCW) Series of Waterproof Materials will be met and exceeded in this test project, and in the future, CN2000® will be the choice of this State for its waterproofing material needed for infrastructure projects. 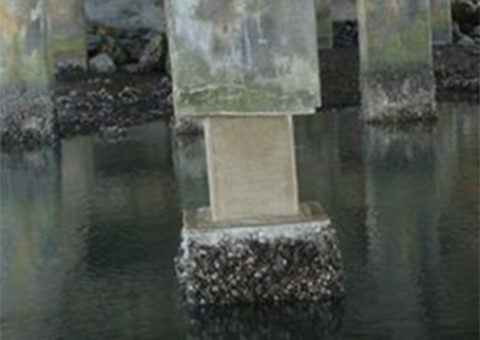 Each Pile that supports the bridge is an independent reinforced concrete column 18 inches by 18 inches and is entirely shielded by a 6 inch concrete shielding jacket. 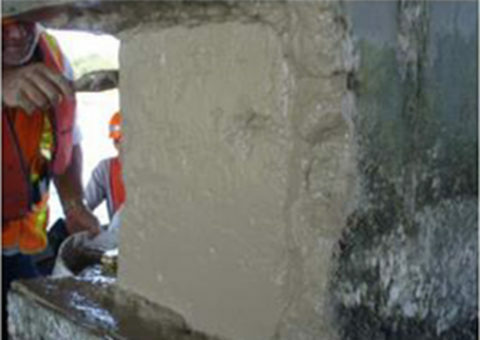 3 weeks prior to the Test Project, Department of Transportation workers removed a 24 inch section of the 6 inch concrete shielding jacket of the sea water/air interface zone, on 1 pile and ½ of the concrete shielding jacket of a second pile, for comparison purposes. 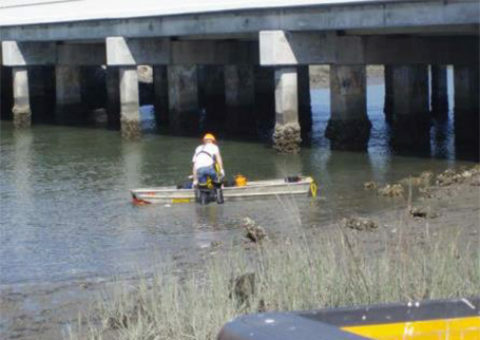 At low tide, when the work area was completely exposed, Department of Transportation workers under the guidance of Kelso Coatings personnel and under the watchful eye of State Environment Conservation Personnel thoroughly cleaned the exposed piles down to the substrate. 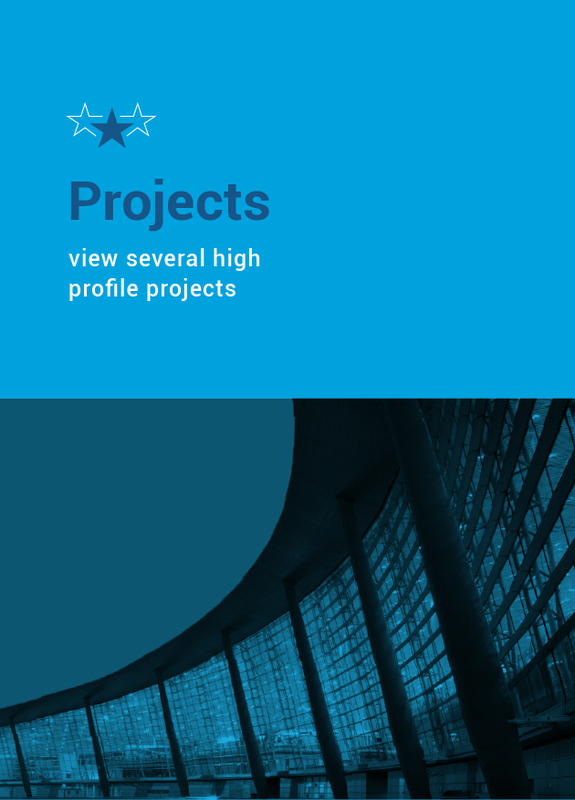 OPG can continue the next phase of installing the pipes and releasing the water. 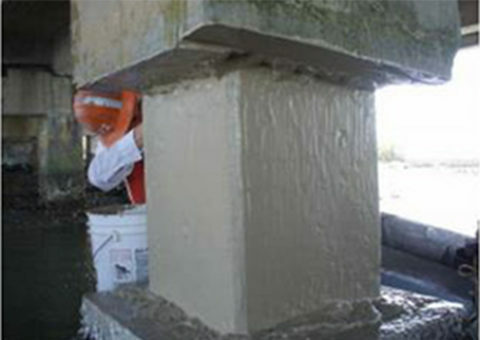 After the second coat of CN2000®B had set, workers applied a flexible CN2000®C+D coating by brush over the areas previously coated with CN2000®B to ensure a complete waterproof membrane of the pile to protect the CN2000®B coating from the environment to allow proper curing.